We have a wonderful selection of the finest loose leaf teas with a large selection to choose from...enjoy! Each bag will make aprox. 10-12 cups. 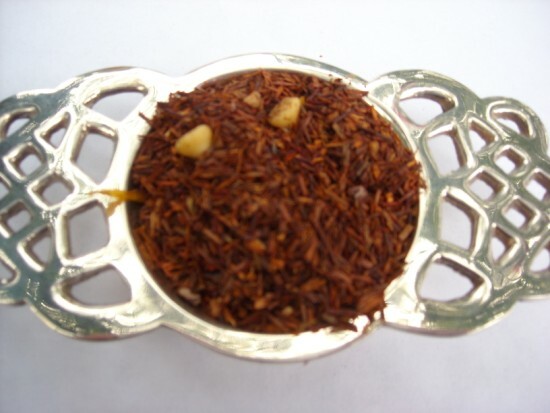 Belgian Chocolate Rooibos Tea - Cocoa truffle notes are brought to the fore with fruity rooibos. A chocolate lover's paradise is heightened with the addition of cocoa bean. 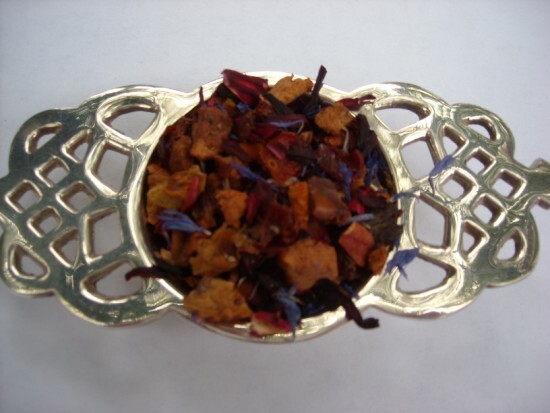 Blue Eyes Herbal Tea - Camella's Signature Tea! Inspired by old Blue Eyes himself. This fruit blend has a mysterious character. 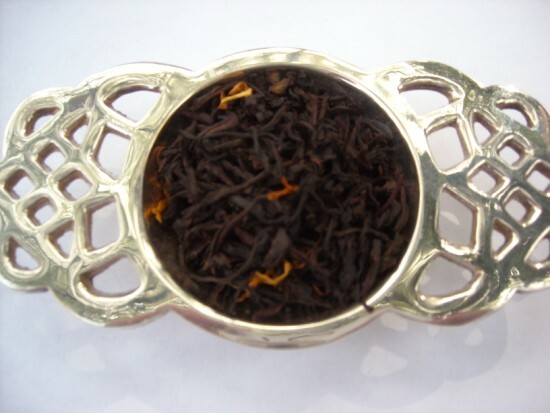 Apple, rosehip, hibiscus and caramel gives this lovely pink tea the flavor of a caramel apple at the fair. 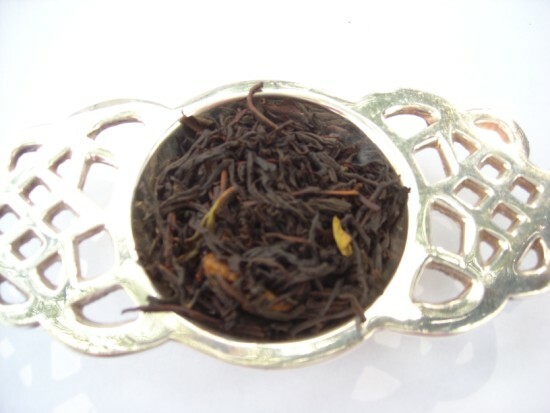 Blue Mango Green Tea - Notes of mango create an exotic fruit pungency. Pineapple adds highlight to the mango characteristics with a wonderful clean finish. 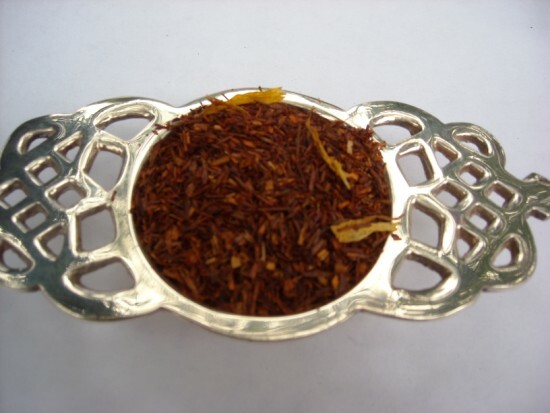 Bourbon Street Vanilla Rooibos Tea - The cinnamon spice flavoring gives this tea a wonderful vanilla n' jazz character. 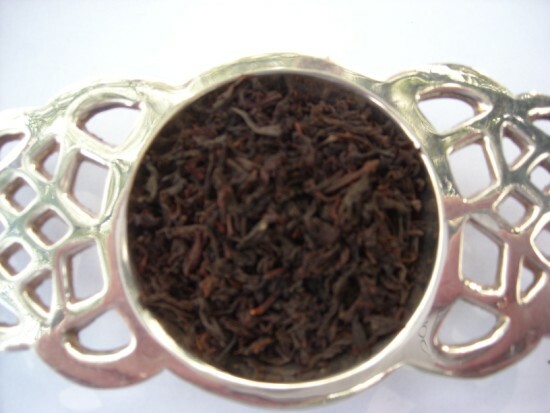 Caribbean Rum Black Tea - Fine Assam tea flavored with an aromatic intoxicating rum. 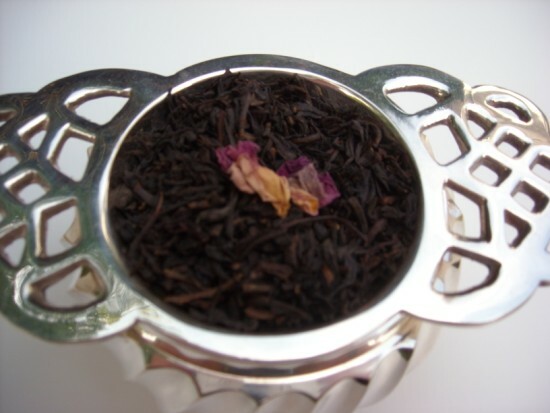 China Rose Black Tea - Rose petals are layered with black tea leaves as they dry, imparting a sweet delicate fragrance. Wonderful for a Bridal Tea! 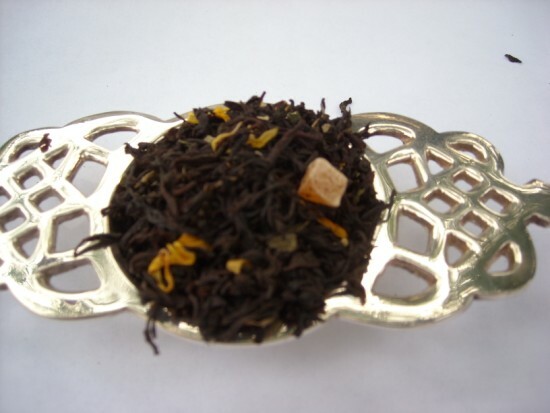 Chocolate Caramel Black Tea - A fine China tea flavored with cocoa bits and caramel. Chocolate Mint - Fresh lively mint combined with full flavored chocolate tea. Reminiscent of an after dinner mint! 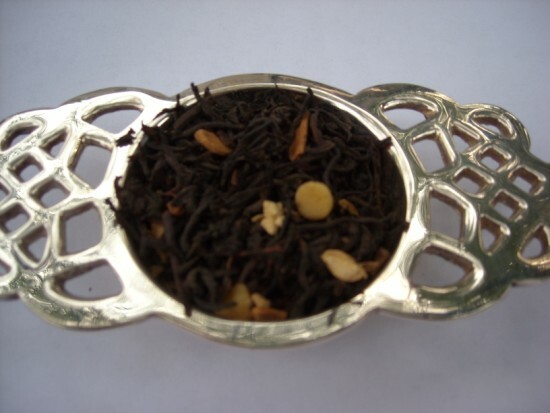 Ciao Amaretto Black Tea - A combination of cherry and almond with a dash of sugar that gives this tea a depth of character. Crime of Passion Green Tea - Memories of the Copacabana Beach in Rio. 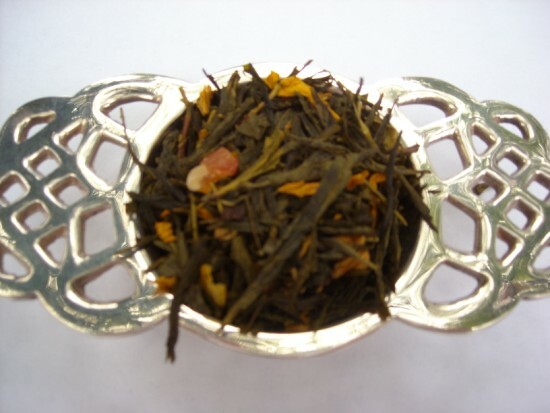 Papaya, sunflower petals and criminally exotic passion fruit notes infuse this superior green tea. 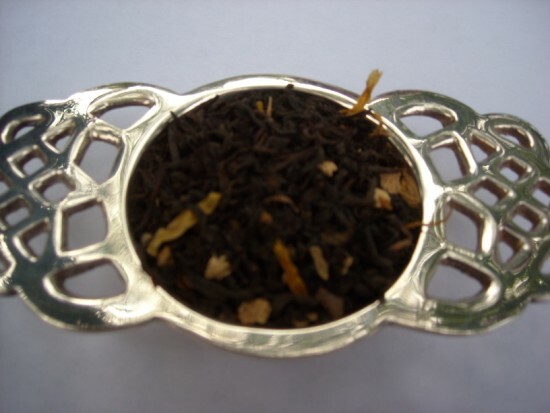 Earl Grey de la Creme Black Tea - Flavored with the same oil of bergamot as the classic Earl Gray, but with a hint of vanilla and creme. A smooth and aromatic blend with a wonderful creamy-fruity flavor that appeals to a wide range of tastes. 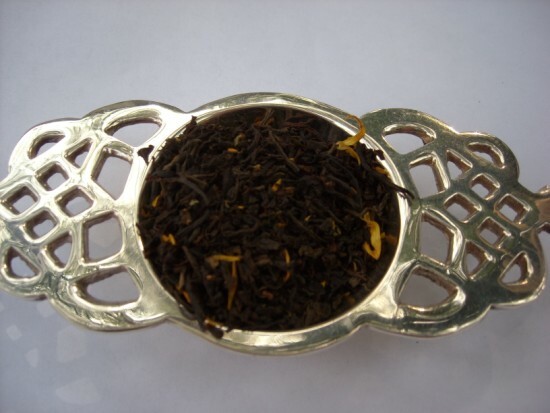 English Breakfast Black Tea - One of England's favorites! Good body, but not overpowering with satisfying full tea flavor. 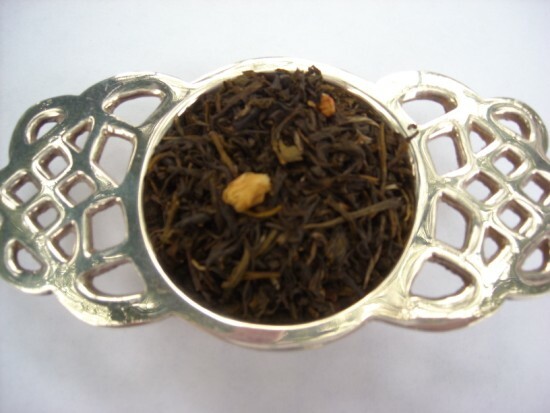 Hazelnut Black Tea - Rich creamy flavor of roasted hazlenuts makes this a very special tea. 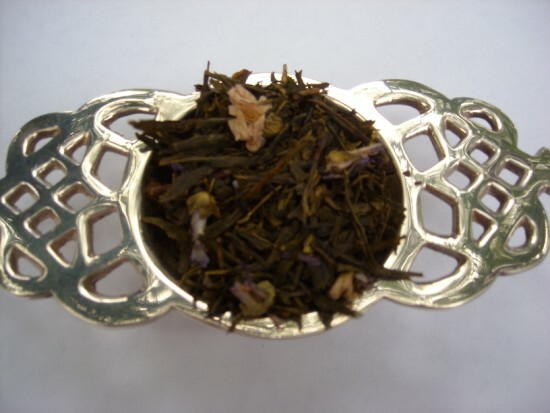 Jasmine Green Tea - A green tea with surprising body and a captivating floral character accentuated by specially selected May Jasmine blossoms. 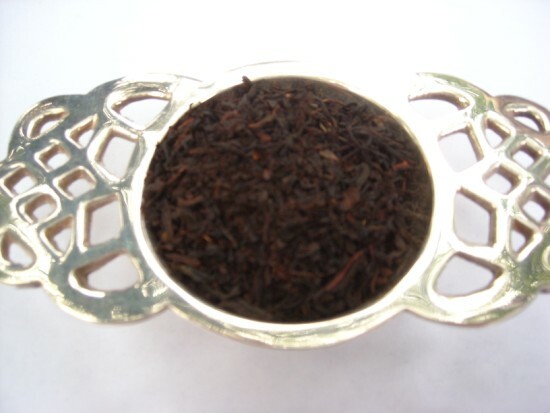 Lady Londonderry Black Tea - One of England's favorites! Round cup with good flowery and malty flavour. Hints of strawberry and lemon make this a perfect afternoon tea. Night of the Iguana Chocolate Chai - Seasonal Malabar Coast spices with sweet caramel come to the fore with a sensational White Belgian Chocolate finish. Wonderful dessert tea topped with whipped cream! 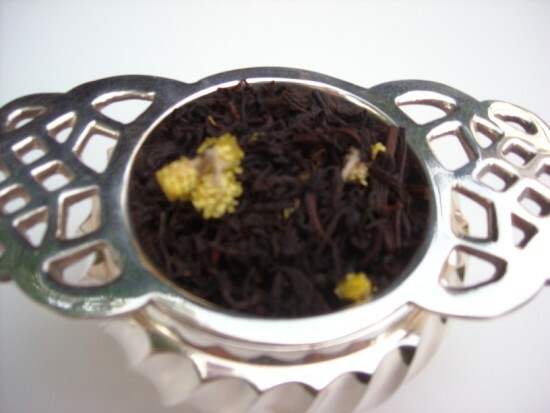 Passion Fruit with Orange Herbal Tea - A mixture of passion fruit, apple bits, hibiscus blossoms, rosehips and citrus peels. 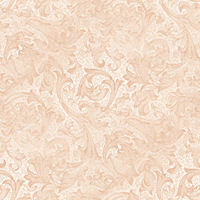 Beautiful rich pink colour! 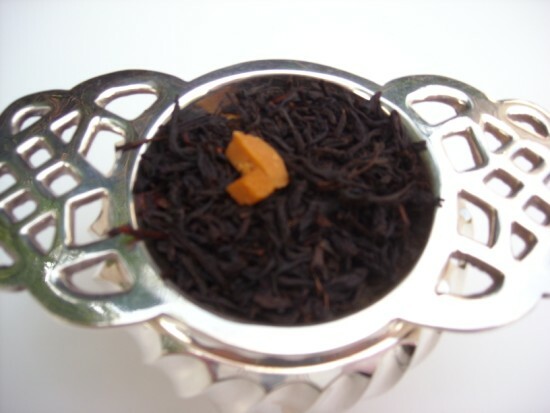 Peach Apricot Black Tea - A flavorful, tasty combination of mellow peaches with deep, full-flavored apricots that makes a stunning bright and coppery tea. 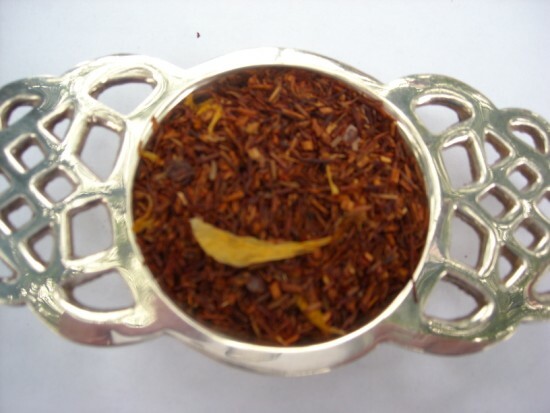 Raspberry in Paris Rooibos Tea - This delicately flavored rooibos invokes the mellow taste of a fresh raspberry. When sipping this lovely tea, picture yourself in a fruit stall in Montmartre, basket in hand, picking a pound of succulent red berries. 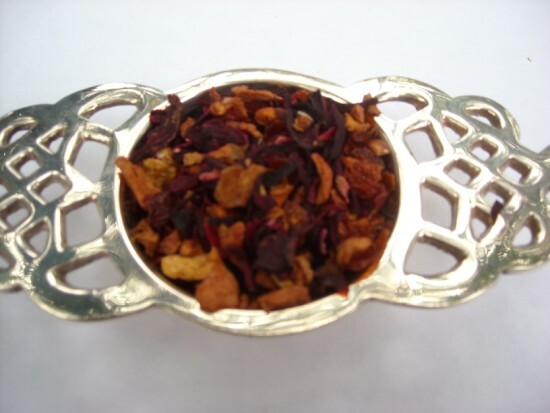 Summer Cherry Black Tea - A luscious treat for your senses, releases a deep ruby-red swirl of fresh cherries and berries. Wonderful summer tea! 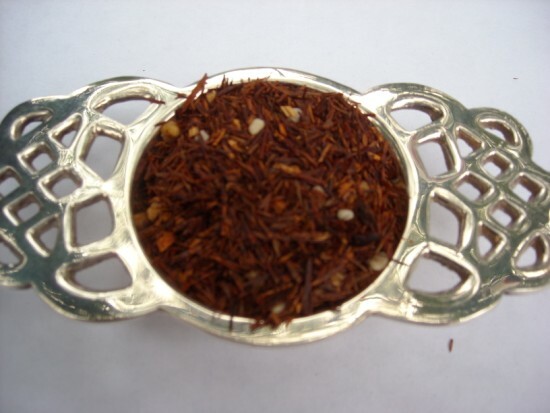 Vanilla Chai - Creamy Madagascar vanilla with Malabar Coast spices. A lively ginger finish is accentuated by candy cardamon. Topped with whipped cream makes it decadent! 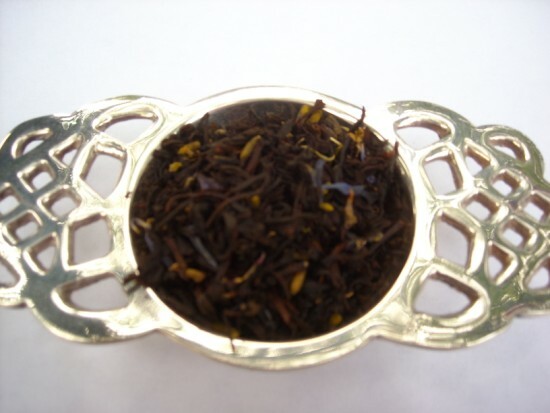 Versailles Lavender Earl Grey - One of the most delicious Earl Greys. 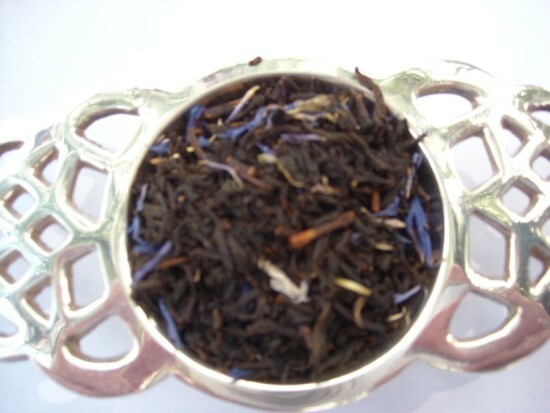 French 1 super blue lavender transports a floral harvest of Provence to an intoxicating Earl Grey. One of Camella's favorites! 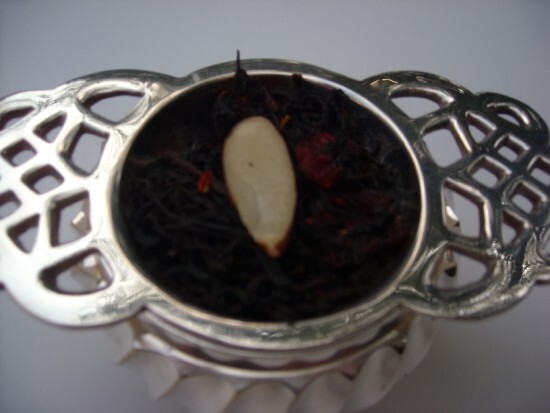 White Chocolate Toffee Rooibos Tea - A decadent blend of rooibos with toffee bits, white chocolate chips and cocoa. A rich sweet treat and one of Camella's Favorites! 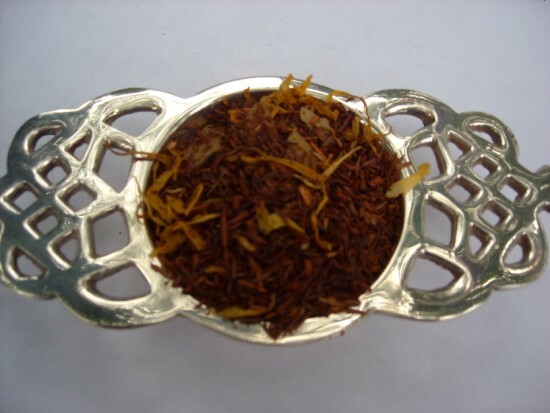 White Swiss Truffle Rooibos Tea - Exquisite sweet chocolate bakiness with tidbits of mint that meander throughout. One of Camella's Favorites!